Some time ago I was given the opportunity to review a copy of a new-to-me formula recipe book. 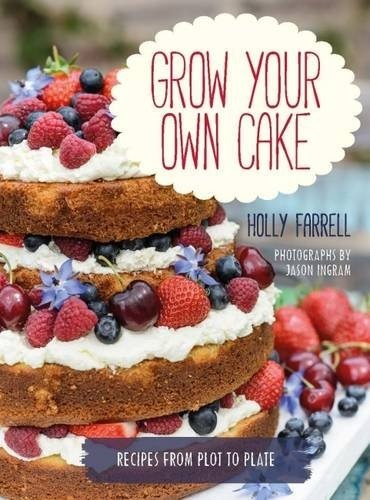 The book is called "Grow your own cake" by Holly Farrell, and the subtitle says: 'recipes from plot to plate'. So basically this book promises to take you by the hand and lead you through the whole process of planting and caring for your home-grown fruit and veggies until you are ready to bake with them! Baking from scratch and crop sounds like it gives an extra dimension to baking. Grow it, bake it, eat it! I do believe she is talking to me! Although I am a fervent baker, I am surely not much of a gardener, I simply don't know what to do. Besides the raspberries and the apple and plum tree in our garden there should be so much more that I could grow. Probably... with a lot of help. Of course the book follows the seasons in the chapters: spring & summer cakes, autumn & winter cakes. Afternoon tea, pudding and savoury bakes are other chapters. Up until now I baked one sweet and one savory recipe from this book, one a success, the other... not so much. I baked a sweet potato and marshmallow cake (page 91) which is the traditional Thanksgiving dish but is presented here in cake form instead. My family was a bit apprehensive at first but loved the end product. Then I baked pesto-potato scones... not a success, the resulting scones were tough (overbaked?) and the pesto too overpowering. But.. that being said, I think I probably need to tweak the pesto recipe a bit because mine turned out quite wet. Besides the usual suspects such as carrot cake, courgette cake and beetroot brownies there are quite a few other recipes that use vegetables. I am planning to try of the more unusual recipes in the book such as fennel cake and the savory pea cheesecake.... Or maybe tomato cupcakes? And that brings me to the only downside of this book, there are plenty of pictures of the gardening in the book but not every recipe has it's own image, which I normally don't mind because I can pretty much picture what is meant but for the unusual recipes I would have liked a pointer of what to expect. As a whole I think this is an excellent book with a lovely look to it for the novice gardener who likes to try their hand at baking. I think I will longingly look at my fruit trees and raspberries and leave the gardening to someone better at that. I will bring you a cake in exchange for produce though! "Grow Your Own Cake"; recipes from Plot to Plate by Holly Farrell, photographs by Jason Ingram, is published by Frances Lincoln. Love that title. Looks/sounds like a beautiful book. Recipes should prove interesting. Did you try the tomato one? Loooog ago I bake a tomato soup cake and really was surprised it was so good. That was way back in the day when I did that kind of convenience thing.